Looking to hear some darker - but all true! - stories? 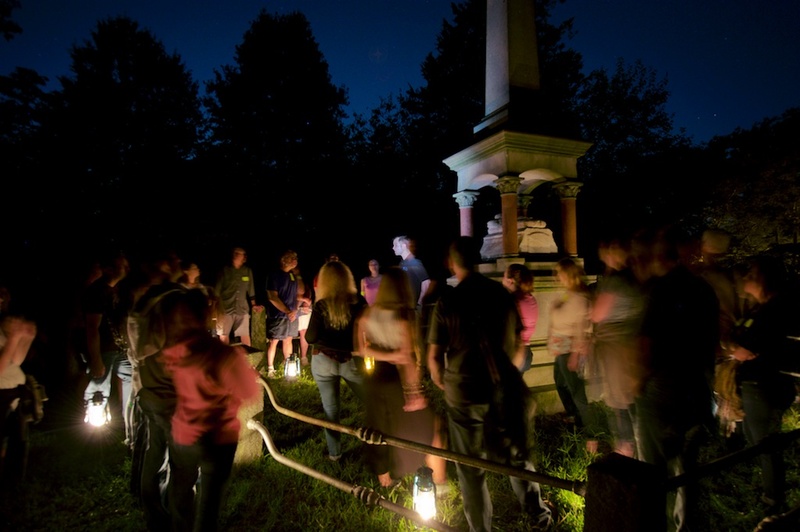 Meet fallen angels and helpless victims on this two-hour walking tour through Sleepy Hollow Cemetery. Join us as we visit by lantern light the flamboyant businesswoman branded “the wickedest woman in New York,” a debonair counterfeiter, the scene of a grave robbery, victims of “the Mad Murderer of Sleepy Hollow,” a brotherly murder-suicide, and the celebrated opera singer who was alleged to have assaulted, extorted, and killed various of her seven husbands, and more. Subject matter is not suitable for children under 18. For the enjoyment of all tour goers, please respect this policy. Dates: Every Saturday night, plus Sunday 5/26 Memorial Day Weekend. Check specific dates for start times as sunset times vary. Skill level: This tour takes place in the dark. The route includes several steep hills, some stairs, as well as grassy, unpaved and gravel roads. There is no place to sit down during the tour. The route is approximately 1.5 miles.